Thank you to all who attended the 73rd Annual Newbold On-Property Sale on Thursday 21st September and congratulations to all buyers. All year long we have been celebrating 100 years since Newbold stud founder, the late WJ Dawkins, registered his Dorset Horn stud. As his incredibly proud descendants, we were very pleased with this year's sale result with 145 of 157 head cleared to a $7000 top and at a $1335 average, significantly up on the previous year. Read on for sale report by Ian Turner, Superior Selections. In a pre-sale welcome, a very emotional Bill Close highlighted the stud’s proud history from foundation; including the development of the world’s first Poll Dorsets in 1937 through to the commencement of a Texel stud in 1993 and a White Suffolk stud in 2000. Bill’s involvement commenced 41 years ago in 1976 with his mother, Louise Close and now Bill and Angela’s daughter Kate and husband Craig McLachlan are deeply involved. Newbold adopted scientific performance measurement from the beginning of Lambplan and the genetic strength of the stock on offer was second to none. The presentation and phenotype of the offering matched the impressive figures and this was certainly appreciated by the 46 registered bidders from most regions of SA and Victoria. 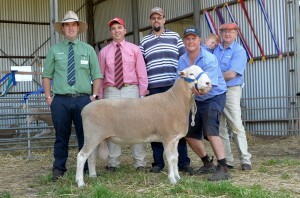 Fifteen stud Poll Dorset ewes opened the sale, these all clearing to $500 and averaging $395. 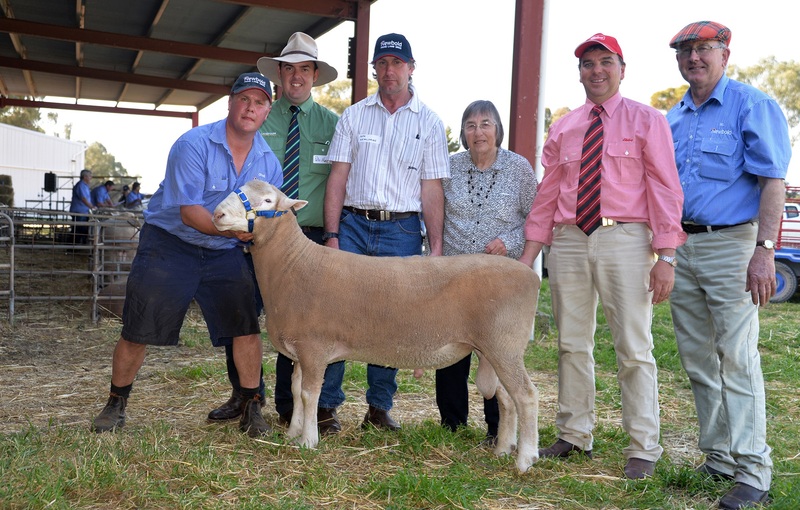 The Kelly family, Zacman Poll Dorset stud, through Landmark Naracoorte purchased the two top priced ewes at $500 and $475, while the Cook family, Bsarma Poll Dorsets, Minlaton with six, all at $400, was the volume buyer; the latter having also purchased a top stud ram from Newbold at the Adelaide Elite sale earlier in the month. The 142 strong ram offering then commenced with a great line-up of 11 stud Poll Dorset rams. To match the occasion, these all sold to the sale top of $7000 and averaged $3705. Grant Johnson, Select stud, Peake kicked the draft off on a top note with a $5750 winning bid for Newbold 160046Tw. The Oswald family, through Landmark Wudinna then chimed in with winning bids on lots 2 and 4 of $6750 (for N.160344 – C+ 194) and $5250 (for N.160333 – C+ 200) for their stud founded last year. After purchasing lot 3 for just $2000, Ken and Betty Walker, Kenlorne stud, buying through Elders Millicent were then pushed to $7000 for lot 5, Newbold 160041. With terrific phenotype, the ram’s balanced figures of 14.8 Pwwt, -1.2 Pfat, 1.5 Pemd and C+ of 194 topped this off to make the ram such a balanced package as a stud sire. The value of an underbidder was clearly highlighted by Shipard Stock. Bidding through Landmark Kimba, after making the long trip from Eyre Peninsula, they were underbidders on all four of these high selling rams, but went home empty handed. Kevin Norman, Green Triangle Livestock, Mt Gambier has attended Newbold sales for well over two decades and was purchasing agent for clients, Westgarth Trust and Strathdownie estate, both with rams at $2800. The positivity from the Poll Dorset stud ram draft flowed on to the flock ram offering of 66 rams, these all clearing to $2000 and averaging $1265. The top was paid six times and all by the biggest volume buyer, Wiliam Hurn, SB & SJ Hurn, Angaston, buying through Elders Mt Pleasant’s Richard Hentschke. Over the draft they purchased 11 top rams at an $1855 average to be far and away the most prominent buyer. The biggest volume buyer of flock rams over the whole sale was Bill Pearce, WA & WB Pearce, through Elders Strathalbyn with 12 rams at an $892 average, 10 of these coming from the Poll Dorset draft and two from the White Suffolk draft. 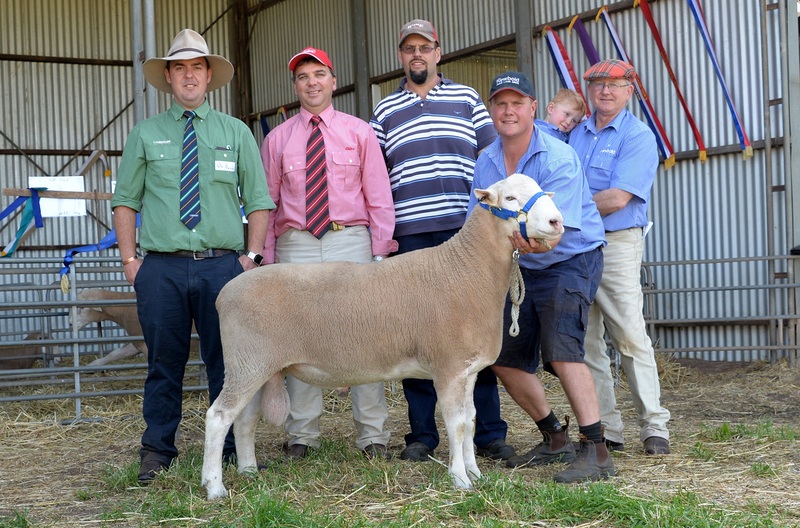 The impressive White Suffolk stud ram draft of five rams, with weights up to 148kg, cleared to $3100 and averaged $2160 in great value buying. This was the first time Newbold has offered any White Suffolk stud rams in their annual sale. Again Grant Johnson got in early and was able to snare the first, N.160084 for just $2100. With great figures, culminating in a C+ index of 209, this ram was certainly a bargain buy. However it was Luke Martin who purchased the $3100 top, N.160427Tw. Sired by Pepperton 130728, it had great breed type and outlook supported by top figures, including 2.5 for muscling and a Carcase Plus index of 207. Rob McDonald, Paramount stud, Kersbrook has been the shearer at Newbold for four decades and with his wife Pat, paid $2100 for another Pepperton 130728 son from early in the flock ram draft, N.160329Tw with a C+ index of 212. 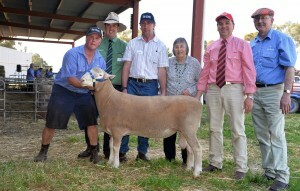 Trevor Mudge, TR & OA Mudge, through Landmark Balaklava picked up six rams at a $1650 average. These included one Poll Dorset listed stud ram at $2000, plus five White Suffolks to $2000, including three listed stud rams. From the 52 White Suffolk flock rams offered, 44 sold at an $1119 average. Over both lines, the White Suffolks were down $94 on last year, but the big lift in the Poll Dorset drafts far outweighed this slight disappointment when analysing the whole sale. Several top and volume White Suffolk buyers from last year were either not present, or did not need rams this year, so the achieved result was quite positive in the final analysis. Most prominent White Suffolk flock ram buyers were MS & J Dittrich, through Elders Roseworthy, with six to $1600 and averaging $1317, and TS & DA Quinn, through Elders Burra, also with six to $1400 and averaging 1067. Four Texels and four Texsets completed the offering, with AD & BR Southern through Elders Tumby Bay purchasing three of the Texels to $800. 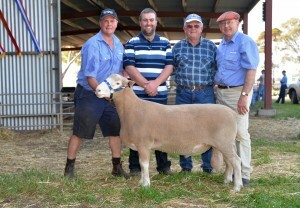 Pictured with the $7000 top priced Poll Dorset ram at the celebratory Newbold centenary sale are Craig McLachlan (left), and Bill Close (right) from Newbold; Landmark Gawler’s Peter Marschall; buyers Ken and Betty Walker, Kenlorne stud, Millicent; and Brett Peters, Elders Roseworthy. Pictured with the $3100 top priced Newbold White Suffolk ram are Peter Marschall, Landmark Gawler; Brett Peters, Elders Roseworthy; purchaser Luke Martin, Minlaton; and Craig McLachlan (holding ram) and Bill Close (holding grandson Hugo), Newbold, Gawler River. Newbold’s Craig McLachlan (left) and Bill Close(right) are with Grant Johnson, Select stud, Peake and his father Trevor who founded the stud in 1956, and the ram Grant purchased for $5750.